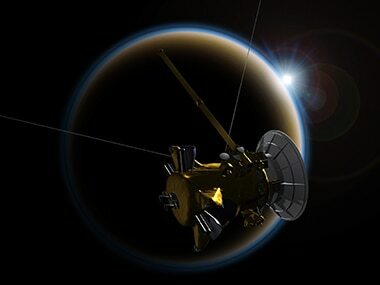 Nasa's robotic spacecraft Cassini that has been orbiting Saturn for 13 years is set for a final dive towards the planet and burn up in its atmosphere in a "grand finale" after it flies past Titan, Saturn's largest moon, on 15 September. Cassini's imaging cameras will take their last look around the Saturn system, sending back pictures of moons Titan and Enceladus, the hexagon-shaped jet stream around the planet's north pole and features in the rings. With its antenna pointed at Earth, the spacecraft will send back its final images and other data collected along the way. Soon after, Cassini will burn up and disintegrate like a meteor, NASA said in a statement. Cassini, a collaboration between Nasa, ESA and the Italian space agency, Agenzia Spaziale Italiana, was launched for the first time on 15 October, 1997. The spacecraft entered orbit around Saturn on 30 June, 2004, carrying the European Huygens probe. After its four-year prime mission, Cassini's tour was extended twice. Its key discoveries have included the global ocean with indications of hydrothermal activity within Enceladus — a potential target for scientists that can harbour life — and liquid methane seas on Titan. As Cassini plunges past Saturn, in its final run, the spacecraft will collect some incredibly rich and valuable information that was too risky to obtain earlier in the mission. In 2017, Cassini completed 13 years in orbit around Saturn, following a seven-year journey from Earth. The spacecraft is running low on the rocket fuel used for adjusting its course. If left unchecked, this situation would eventually prevent mission operators from controlling the course of the spacecraft, NASA said. NASA chose to safely dispose of the spacecraft in the atmosphere of Saturn, in order to avoid the unlikely possibility of Cassini someday colliding with one of Saturn's moons, the statement said.